And now for something completely different — I review a children’s book! You’d think I’d do this more as we certainly have enough of them in the house and I read enough of them aloud. But rarely am I impressed enough to add a kids’ book to my list of reviews. Clementine is a definite exception! My parents bought this book for Emma, for Christopher’s birthday (don’t ask) and by the time the kids went to bed that evening, most of the adults in the room had had a look at the book and read a few sentences out loud — it’s just that engaging. This did, however, make me fear that it was going to be one of those kids’ books enjoyed mainly by adults — because you’re laughing at the child character, rather than with her. Clementine could be that kind of book — the title-character, an overly-imaginative third-grader, could easily be labelled with both ADHD and OCD, and I’m sure her principal would love to get her on an ISSP if she’s not already — but it’s not. The humour is as appealing to kids as to adults, though perhaps for different reasons. Emma and Christopher’s favourite part was when Clementine suggests to her apartment-building-superintendent father that the pigeon-poop problem on the outside of the building can be solved by putting tiny diapers on all the pigeons. My favourite part was when Clementine’s baby brother asks to “Go for a wok?” and Clementine puts him in the wok and spins him around the kitchen floor. Really, there’s something for everyone here. Emma loved having the book read aloud, and Christopher, while disdainfully insisting that “Clementine’s weird” (presumably because she’s a girl) hesitantly asked if we’d come into his room to read the last couple of chapters. 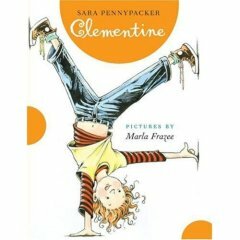 Clementine’s perspective on the world is fresh, funny, and absolutely believable, and her family is adorable. This is the first I’ve heard of Sara Pennypacker as an author, but illustrator Marla Frazee is already popular in our house, having illustrated The Seven Silly Eaters, which is one of Emma’s favourite books, and On the Morn of Mayfest, which we also enjoyed. I notice that Amazon has a listing for a sequel called The Talented Clementine, scheduled for release in April 2007, and I can definitely see this series holding a permanent spot on our bookshelves.